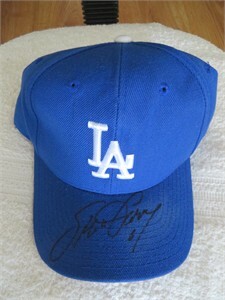 Los Angeles Dodgers wool blend replica cap or hat autographed on the bill in black marker by former All-Star first baseman Steve Garvey. NOTE: has minor discoloration around the last name of his signature. Obtained in person, with certificate of authenticity from AutographsForSale.com. ONLY ONE AVAILABLE FOR SALE.